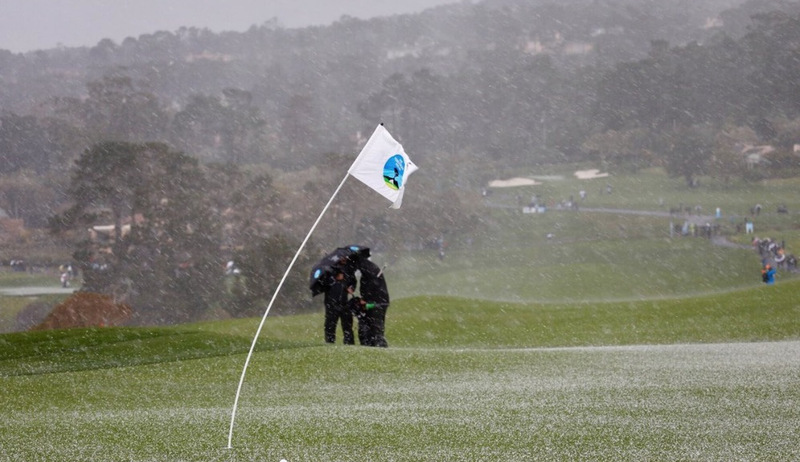 A severe hail storm caused a near three-hour delay on Sunday at Pebble Beach. Phil Mickelson is on the verge of a fifth victory at Pebble Beach but he’ll have to wait until Monday morning to put it in the books. What started out as a sunny day at the Pebble Beach Golf Links turned dismal right before the final group was set to tee off for the final round. Hail, high winds, rain and just about everything else swept the property, sending everyone in search of shelter. It took a long time to clean things up and get the greens in order. It was nearly 1, Pacific time, before the final group of Mickelson, overnight leader Paul Casey and Casey’s amateur partner got going. Mickelson went to work and three front nine birdies saw him cut Casey’s three-shot lead to one at the turn. Mickelson picked up another birdie at the 10th to tie Casey then took over the solo lead when Casey missed a nine-foot par putt a the 11th. Another bogey at the 12th gave Mickelson another shot up on Casey. Mickelson holed an eight-footer for birdie at the 13th to go five-under for the day and 17-under overall. At the par five 14th, he dropped one from six feet and found himself at 18-under. With daylight fading, Mickelson parred 15 and 16 and wanted to play the par three 17th but Casey refused to go on, marking his three-foot par putt on 16 green. Mickelson, obviously perturbed, walked off without shaking Casey’s hand. Mickelson told his caddie/brother Tim that he thought he could finish 17 and hit an iron off 18th tee then come back in the morning to finish. Instead, Mickelson will watch Casey putt out then they’ll play the last two holes. Scott Stallings was finished. He shot 66 and posted 15-under, tying Casey. Mickelson should be able to handle the final two holes in the morning. Play will re-start at 8 a.m. Pacific time. Mickelson is poised to win this event for the fifth time, tying him with Mark O’Meara for the most victories in this Pebble Beach Pro-Am format.